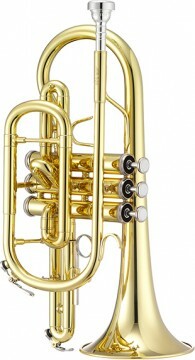 Jupiter have put together a great value package with their JCR700 cornet.The monal valves,normally found on professional instruments,are very smooth and the overall intonation and feel of the instrument is excellent. With it's 11.68mm bore 120mm bell 1st..
Jupiter have put together a great value package with their JCR700 cornet.The monal valves,normally found on professional instruments,are very smooth and the overall intonation and feel of the instrument is excellent. With it's 11.68mm bore 120mm bell 1st valve cradle and adjustable 3rd valve finger ring,complete with case and mouthpiece, this is a great little outfit.